Three countries. Two continents. One game. Those three countries are Sweden, the USA and the Czech Republic. Those two continents are North America and Europe. That one game is football. And this is where that one game has taken Gary Cennerazzo, a native of Scotland, since attending his first PSC Showcase Tour back in 2015. Cennerazzo’s move to Czech second tier outfit FK Varnsdorf earlier this year meant he had signed with a professional club following each of the three PSC Showcase Tours he had attended. Those three tours visited Sweden, where the defender signed with Melleruds IF; Malta, where he was spotted and signed by USL side Tulsa Roughnecks; and Portugal/Spain, where he was scouted by Varnsdorf’s representatives. The 27-year-old’s willingness and hunger to ply his trade while exploring the world perhaps stems from his upbringing. As a child, Cennerazzo enjoyed his summer months in Italy, the home country of his father. Winters were spent in his native Scotland, where his father’s renowned fish and chip shop ‘The Chip Inn’ is currently located. Two contrasting countries in terms of culture and climate, but two countries where Cennerazzo’s passion for the game blossomed. From Scotland and Sweden, to the Czech Republic, via Tulsa, Oklahoma, Cennerazzo has spent the last two years of his life in a manner that some could only dream of. And as PSC’s first player to sign in the Czech Republic, thanks to an exciting, newly-formed eastern European relationship with Aleksandrs Cekulajevs and his partners, we hope many of our combine and tour attendees find success in this part of the world. Check out what Gary had to say when we asked him about life, both on and off the pitch, as a professional footballer, and much more. 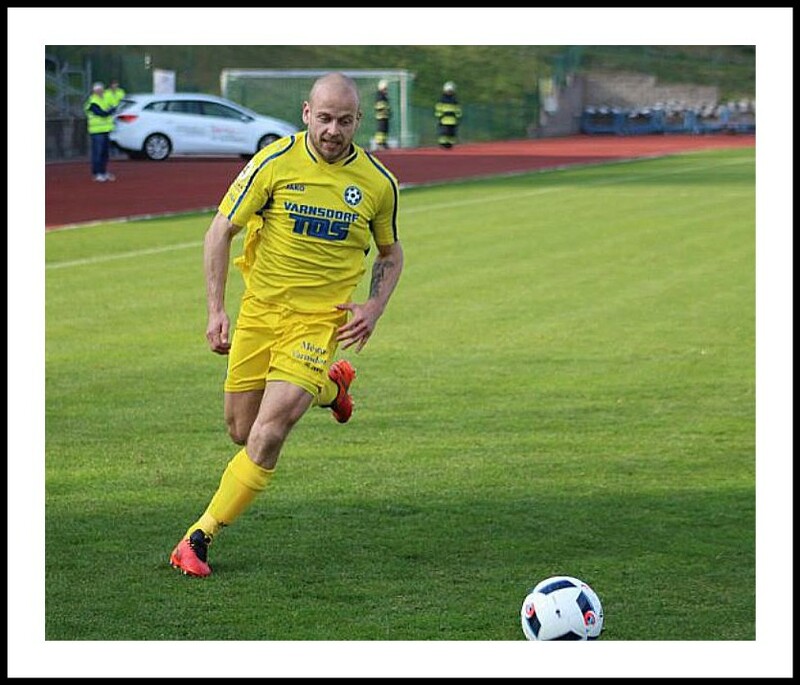 Eye on the ball: Cennerazzo lining up a strike on goal while in action for his current club, FK Varnsdorf. Hi, Gary. How are you finding life in the Czech Republic with FK Varnsdorf? It’s been great and a challenging experience. I’m thankful to PSC for working together with Aleksandrs [Cekulajevs] and his partners to make the move happen. It’s been an enjoyable experience but difficult at times. The communication with locals has been challenging but it’s something I’ve worked hard to adapt to. My main challenge was dealing with an injury I suffered, which meant meant I missed seven of the team’s games. It was the first major injury of my career and dealing with it was mentally testing. It was made harder being away from home, missing family and friends, and, of course, not being able to play. I got through it and worked hard to get back to full fitness. I started my first game since the injury at the weekend and played a full 90 minutes in a 4-0 win. I got an assist and I’m looking forward to a strong finish during the club’s final game of the season. 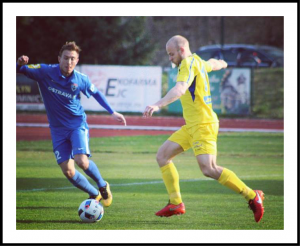 How did your move to FK Varnsdorf come about? It all began thanks to Tom Taylor, PSC’s USA Director and my former assistant manager at Tulsa Roughnecks. I have great respect for Tom and enjoyed working with him. Last year he invited some of Tulsa’s players, including myself, to PSC’s Portugal and Spain Showcase Tour. Originally, I planned to attend the tour, compete in the games, work hard, and enjoy the experience. I ended up performing very well and was notified of some interest from a Czech scout who PSC had invited onto the tour. He [the scout] told me there was interest from a Czech second tier club – and PSC worked hard to organise a trial with Varnsdorf during the January transfer window. I decided to go for it and reignite my career in Europe – I went on a week’s trial and they [Varnsdorf] wanted to sign me after the second training session. I was delighted to compete well at a high level and to be offered a contract in a very competitive league. I’m glad it came about and that’s thanks to PSC, Tom and all the coaches who have helped me massively over the last few years with improving my game and career decisions. It’s a fantastic set up at PSC – I worked closely with the staff and formed some great relationships. 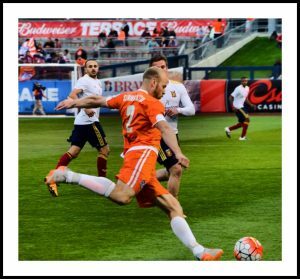 American Dream: Cennerazzo playing the ball out of defence for USL side Tulsa Roughnecks. You spent one season in Oklahoma with USL outfit Tulsa Roughnecks. How did you find both the experience and the standard of football in the USL? I enjoyed my time with Tulsa. It’s a great city, with a great football club and fantastic fans. It was my dream to play in America and I was over the moon when Tom brought me over there after the 2016 Malta Showcase Tour. I’m grateful for the opportunity and it was definitely the most difficult experience of my career. We massively underachieved that season and lost too many games, and at times it became very hard because I hate losing and football is everything to me. The USL is a very competitive league. Most of it is based on athleticism, speed and direct play. Yes, there are teams that play with a European approach, focusing on the possession game and building play from the back, but the majority of teams were very explosive and could cause teams problems with sheer pace and power. It’s a growing league, with ever-increasing financial backing – recently achieving status as the USA’s second tier, behind the MLS, confirms its prowess. There are some great stadiums, facilities and the overall professionalism is fantastic. Competing against and playing alongside players from around the world tested my ability and added to my unforgettable experience. You have played in Scotland, Sweden, the USA and the Czech Republic. How did each level of play vary? Standards in each of the leagues are different and all have different challenges. Scotland is very physical, many teams employ a direct approach, which is not so pretty on the eye, but it’s improving. There’s a lot of good players, though, and hopefully the future is bright. Sweden was also very physical and teams adopted a variety of tactics. There were some good players and it was another great experience for me. The USL is of a high standard now, and it’s tough playing in some extremely high temperatures. Many MLS teams use the USL to develop players, so it’s a very youthful league. It features a lot of talent, and at times is on par with the standards of the Scottish Championship and League One. You are regarded as a fitness fanatic and model professional by many. Do you have any advice for players who are emerging from the college system? For me, having good fitness and the right attitude are invaluable; being the best you can be every single day is a massive part of being a professional footballer. You must be willing to learn, take advice and work hard. I have worked so hard over the last seven years to get to the highest level as I can. Do all the right things all the time and look after your body with the correct conditioning, training and strength work. Follow a solid and healthy nutrition plan that will help boost your performances on the field and just strive to be the best you can possibly be. You need the fire burning inside and you need to be determined to push yourself. I have done this every single day and will continue to learn, improve and push the boundaries. Some players might think they have it all, but if you’re not willing to combine that with hard work and dedication you will never make it to a high level – that’s a fact. You must be positive and be coachable. I have worked with young players who believe they know everything about the game already, if you think like that then you must lose that mindset quickly because there’s always something to learn. Even the very best players are still learning ways to improve their game. You must be willing to take every bit of advice onboard. Captain: Cennerazzo (bottom row, second from left) lining up with teammates ahead of a contest during PSC’s Portugal and Spain Showcase Tour. You attended PSC’s Showcase Tours in Sweden, Malta, and Portugal and Spain. 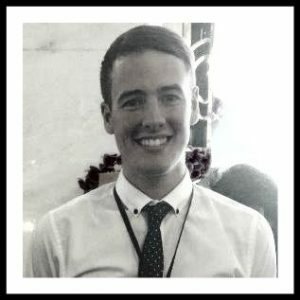 How did you find the PSC experience? All of the tours were great, but Portugal/Spain was a fantastic tour and having my best mate come, Alistair Forster, who has now signed a professional contract in Sweden, made the experience even better. We played some great teams, and, as always, the coaching and knowledge we received from the PSC coaches was superb. Our hotel was located very close to the beach, the facilities were great and the weather was perfect. PSC know how to look after players, make training enjoyable, yet informative, and provide individuals with a fantastic, well-rounded experience. If you believe you are good enough, perform well during the tours, and have the ability, PSC will definitely help you find the platform to excel at the professional level. Finally, following the conclusion of this current season, what are your plans for the future? Well, we have one more game from the current campaign to go, so I just want the team to finish on a high. I am signed until the summer of 2018, so this summer I will go home and spend some time with friends and family, relax and get ready to work hard for my second season with the club. My goal is to play in the Czech Premier League, so it’s a case of continuing to work hard, performing well for the team and hopefully impressing the bigger clubs. Thanks, Gary. We wish you the very best of luck. Thank you. See you all soon, I hope!